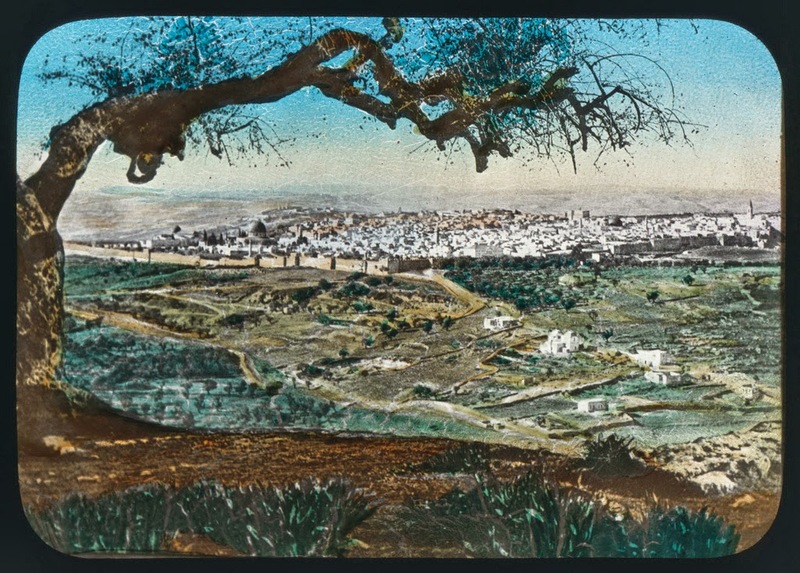 Panorama of Jerusalem and the walls of the city. Note how few buildings were outside the walls of the Old City. The Chatham University is not the only library to digitize their vintage pictures from Palestine. In recent weeks we have discovered newly-scanned collections at several more libraries and even a European church. We will present the collections in future postings. 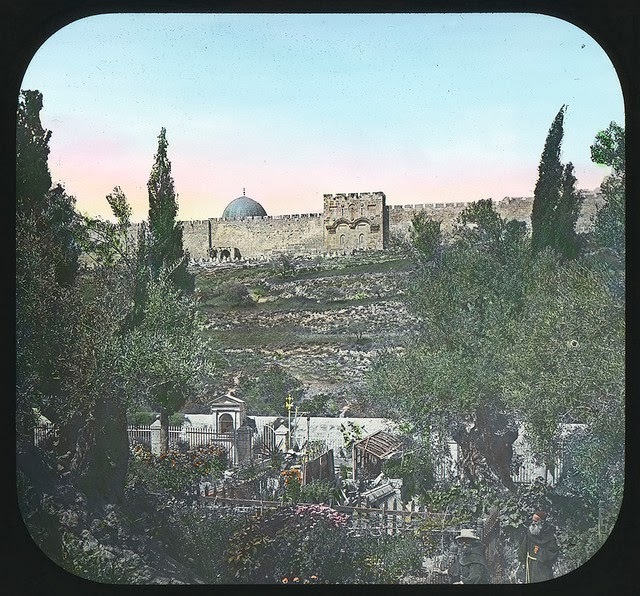 The Chatham University Archives placed all 110 colored slides from the"Holy Land Lantern Slides"online, and in this posting we present a selection to focus on the collection's pictures of Jerusalem's walls and gates. This picture of Jaffa Gate has been featured in previous postings when we found it in other collections. We also determined that the photo was taken prior to 1898 because of a glimpse of the moat wall on the right side of the picture. The wall was torn down and the moat filled in so that the Germany emperor's carriage could enter. 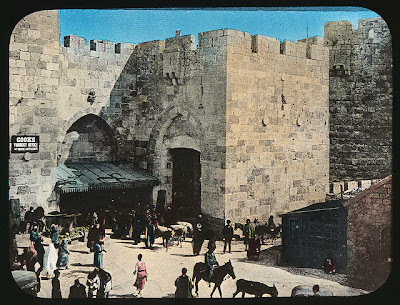 View other historical (black and white) pictures of the Damascus Gate at our previous posting. 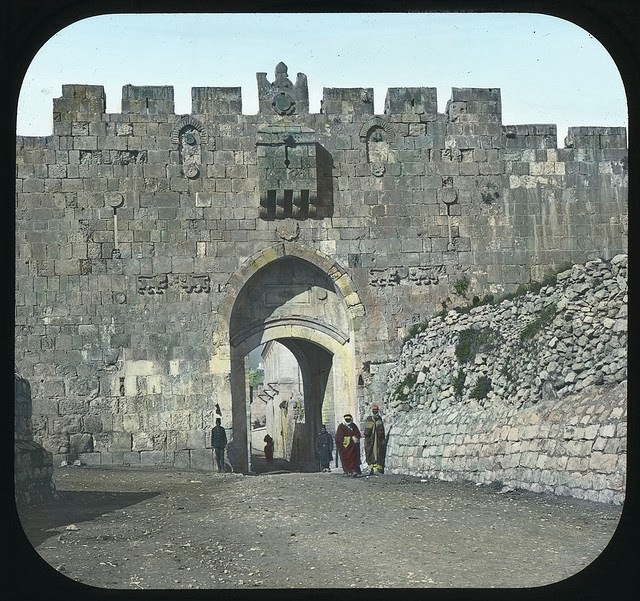 There are no pictures of the Zion, Dung and Herod Gates of the Old City. 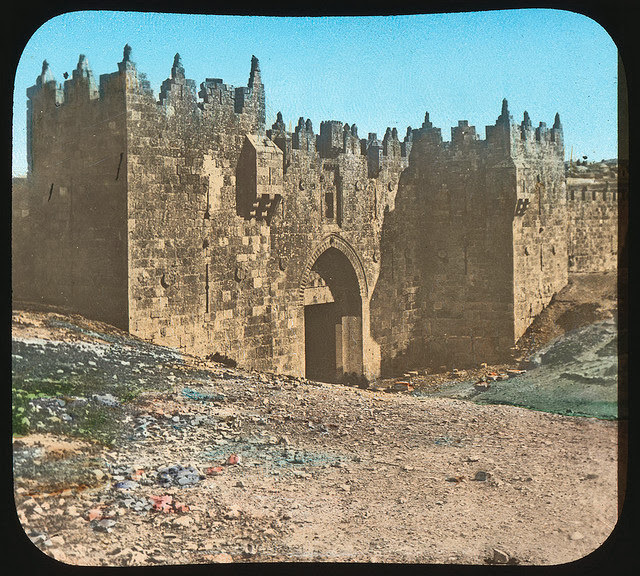 The "New Gate" of the Old City, an entrance built for access into the Christian Quarter, was constructed in 1889, after the photographs were taken. The "lions" carved on both sides of the gate are actually panthers, the symbol of the Mamluk Sultan Baybars (1223-1277). The panthers were believed to have been part of a Mamluki structure and placed at the gate by Suleiman to commemorate the Ottoman victory over the Mamluks in 1517. View an earlier posting on Lions Gate here. See our previous feature on Sha'ar Harachamim and the graves beneath it here. Click on photos to enlarge. Click on the caption to view the original picture.